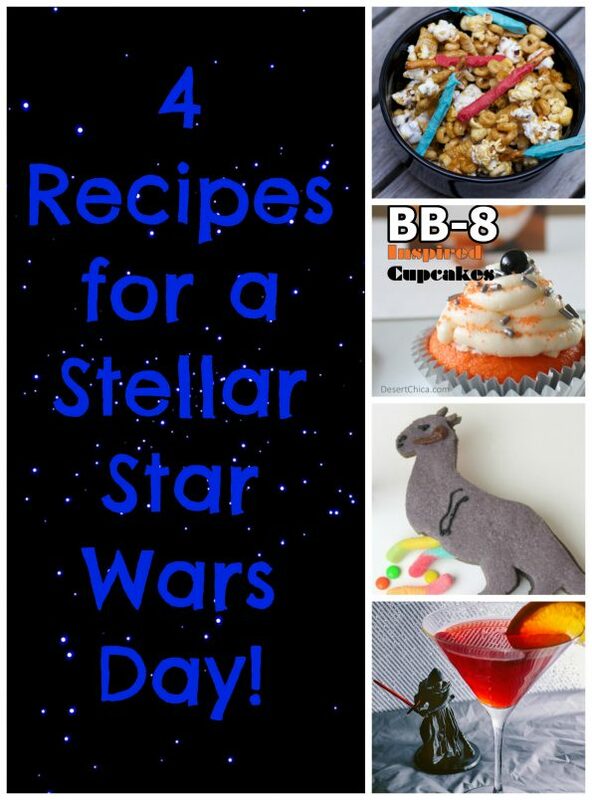 4 Recipes for a Stellar Star Wars Day! Happy Star Wars Day! With everything doing on over at Geek Headquarters, this year we didn’t have time to create our own recipe for Star Wars Day so we rounded up a few of our favorites from around the web! So make a couple of these, pop in Star Wars (hopefully original trilogy or Force Awakens and not those awful rumored prequels), and enjoy! BB-8 Cupcakes by Desert Chica- These cupcakes are inspired by everyone’s favorite (not to mention adorable) droid from The Force Awakens. The base is an orange cupcake which Desert Chica notes can be substituted for another flavor with the use of orange food coloring. While the design is obviously BB-8 themed, it is still easy enough for novice cupcake decorators (like us) to do. Tauntaun Cookies by StarWars.Com- For the more ambitious baker, StarWars.Com has created some amazing cookies inspired by The Empire Strikes Back. These cookies even have candy guts! Not going to lie, these cookies make us aspire to be better bakers! Star Wars Popcorn Mix by Close to Home- Popcorn and cute little pretzel lightsabers? Yes please! Close to Home has created a snack mix perfect for any Star Wars party (where were these last summer when we were looking for recipes for the Star War Swim Ups we attended?). While it may be a little more work than a traditional snack mixes, the payoff is well worth it! Kylo Ren-tini by Pop Sugar- For the last recipe we wanted to take it to the Dark Side. So we decided on Pop Sugar’s Kylo Ren-tini. This martini is comprised mainly of red wine and amaro. Complex like Kylo Ren, this cocktail is the ideal companion for the non-stop feels and emotions that one experiences during The Force Awakens. This is just a small number of recipes that we have found. For more fun Star Wars food ideas visit our Star Wars Pinterest board! How will you be celebrating Star Wars Day? We’d love to hear, comment below or use the hash tag #GeekEats. Until next time, May the Fourth be with You! *This article is comprised of recipes collected by the Geeks; Original recipes were created by the listed sites. View our Disclosure Policy for more info.